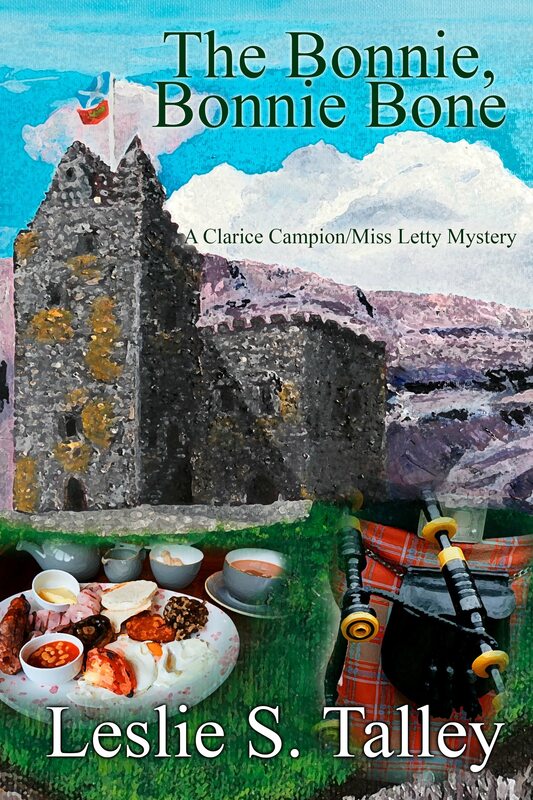 This fourth installment of the Clarice Campion/Miss Letty series finds Clarice, her husband Otis, and their permanent guest, former Silent Screen star, Miss Letitia Lorraine, acting as exchange caretakers/B&B hosts in a Scottish castle which sits on an island in the tidal Firth of Lorn. Otis, drilling through the castle wall in search of a leak, discovers two skeletons. One dates from the 1970s; the other from the 1930s. The older skeleton bears a gruesome relic: a third leg growing from its abdomen. A vestigial twin. Did the aristocratic family try to hide this deformity? How many people were privy to this deception? Surely not Earl Randall; they like him. The ninety-year-old Dowager Countess, not so much. Clarice and Miss Letty dig into the archives to try to identify the skeleton. They are assisted by their children, twins Kitty and Pat, at Edinburgh University for a Semester Abroad; the kids' Scottish friend, Mac; six B&B guests from Virginia; and B&B employee Heather, clued in by her news-gathering Gran. Their explorations lead them to a tunnel from the castle, under the firth, to another island. Originally an escape hatch in times of siege, they discover a hidden room fitted up as a dormitory or hospital ward. And what about that gap in the earldom for over a hundred years? The village of Killnish, so picture postcard perfect--as though trying too hard to be Scottish--puzzles them, since it looks as if it grew up overnight. And why are there no graves in the churchyard before 1940?